Space Coast Jr./Sr. High School (Brevard Public Schools District) in Port St. John, FL, serves about 1,600 students in grades 7-12. Principal Sylvia Mijuskovic leads a dedicated, enthusiastic team of educators focused on delivering the highest quality instruction possible in order to help maximize student achievement. Space Coast seeks to provide a holistically balanced educational experience to prepare students to achieve their future college, career, and personal goals. Swirling around the paralyzing tension and gripping fears of Irma is a story of two schools that illustrates how the power of a hurricane pales in comparison to the forces of kindness. Along with millions of others, Mrs. Sylvia Mijuskovic (a.k.a., “Mrs. M”), the principal of Space Coast Junior Senior High School Vipers in Brevard County, Florida, closely monitored Irma’s path as it relentlessly huffed, puffed, and poured its way across the center of the Keys and eventually churned its way up the western coast of Florida. During the storm, Mrs. M had managed a school shelter to ensure the safety of families in her community. 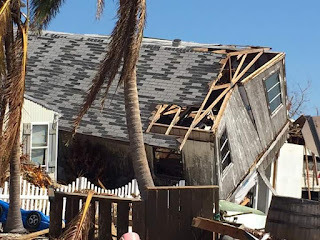 Relieved the Space Coast area did not sustain the debilitating damages that had been forecasted as possible, she immediately turned her attention to other areas she could potentially help. As post-storm reports gradually captured the widespread devastation Irma left behind, Mrs. M came across a Facebook post requesting fundraising adoptions of affected schools that were in dire need. Anxious to help, Mrs. M decided to include students, teachers, and staff at Space Coast in committing to a school-wide adoption of the Sugarloaf School Sharks in Monroe County, Florida. 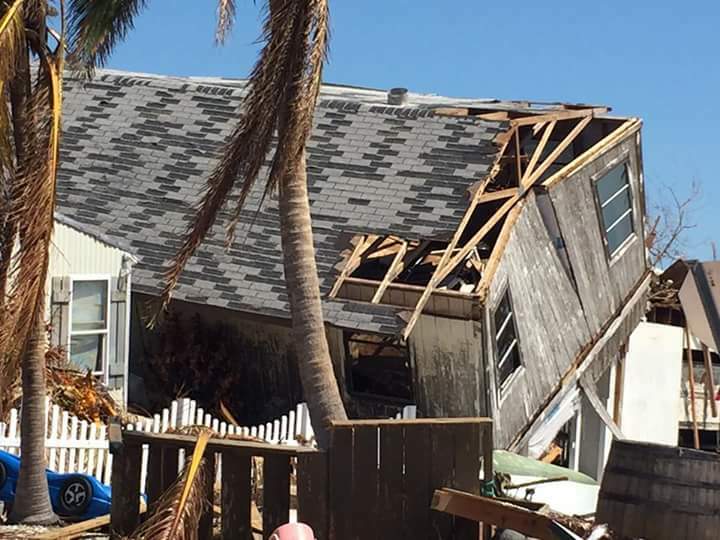 Sugarloaf Key had been pummeled by sustained winds upwards of 130 mph. Irma’s impact caused short-term challenges such as power outages, limited access to food and water, and empty gas tanks. A much longer-term impact was the loss of hundreds of homes, with roughly four out of five Sugarloaf Key residents facing the daunting reality of having nowhere to call home. and residents of Sugarloaf Key faced a much higher rate of home loss. “There is not enough lodging for all of the displaced people here,” said Maria Allen, an Administrative Assistant at Sugarloaf School. Many Sugarloaf School staff and students lost everything they held dear to Irma. With so many families facing housing shortages, nearly 100 students who attended Sugarloaf before the storm have had to seek schooling in other areas, and several staff members have also struggled to find a new place to live. As Irma battered the Keys, Sugarloaf School housed over 500 residents seeking refuge from the storm. In the storm’s aftermath, Sugarloaf School extended lodging beyond campus walls with huge tents. It also formed a distribution center where supplies are collected, packaged, and distributed for any Keys-based family, individual, or school in need. included removing debris and ensuring facilities were safe for students to return. Maintaining hope is a tall order amidst the sheer devastation of the storm, but the spirit of the Sugarloaf Key community has not wavered. “The community is coming together to support one another and to help each other,” said Mr. Russell. Facing an arduous path to the return of normalcy, perhaps most impressive is how Sugarloaf students have responded. “Kids are resilient,” said Mr. Russell. “Many of them were used to living in a house or an apartment, and came back to find they don’t have a home." Much progress has been made, but due to the magnitude of the storm and the severity of obstacles it left behind, fundraising efforts must continue to surge forward. “This is going to be a long recovery for people,” said Mr. Russell. “This is a year or two year process, at least." 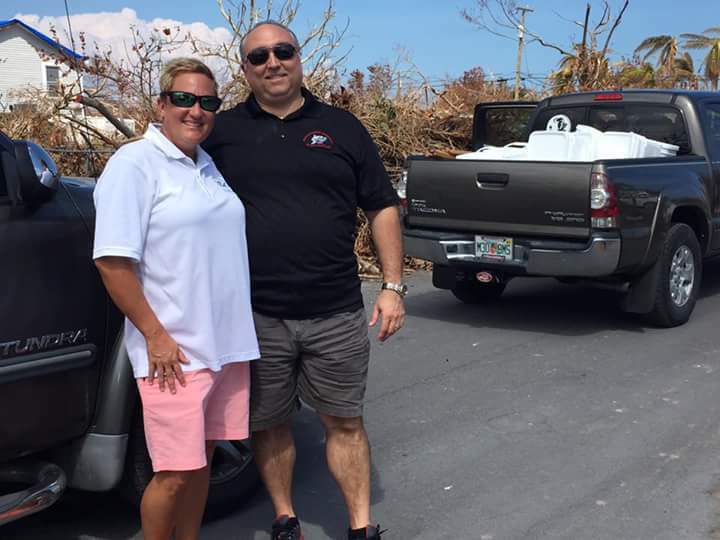 Sugarloaf School Assistant Principal, Kelley Lanier (left), and Principal Harry Russell, have worked relentlessly to support Irma-impacted areas in the Keys. On this day, Ms. Lanier and Mr. Russell, along with Ms. Maria Allen, went door-to-door to provide food and cleaning supplies to families in hard-hit Big Pine Key. Within a week of Space Coast’s adoption of Sugarloaf School, donations had piled in and a truckload containing nine pallets of food, clothing, and other supplies was on the way down to Sugarloaf Key. Arriving with the shipment was a banner signed by Space Coast students, teachers, and staff. (From left) Feeder school Enterprise Elementary School Principal, Mrs. Jean Barleson, Space Coast Jr./Sr. High School Principal, Mrs. Sylvia Mijuskovic, and other Space Coast staff share their love and support for Sugarloaf School prior to loading up a shipment of donations. While candles and flashlights can temporarily shine light into darkness, the friendships and unity at the heart of the collective efforts of Sugarloaf and Space Coast to lift up people in need have meaningfully brightened the spirits of those experiencing it. From this tale of two schools comes an unforgettable and uplifting lesson: Hurricanes are rightly feared but friendships are far more formidable. Donations of gift cards to Publix or Home Depot are being requested of Space Coast families and businesses, and other interested communities. Please contact Mrs. Keri Weeks at 321-638-0750 to contribute to Space Coast’s next donation. To reach out directly to Sugarloaf School, contact Ms. Maria Allen at 305-745-3282. Thank you for your consideration. The mission of Brevard Public Schools is to serve every student with excellence as the standard, and the accomplishment of that mission has resulted in graduating senior Jonathan Guarine receiving the Congressional Medal of Merit. "My guidance counselor, Mrs. LeChien, told me about the nomination," said Jonathan. "At that point, I had heard a lot about Congressman Posey but I had never met him before. When I received official notice I had won the award, I was thrilled. It was a congressional award, so me loving politics and government, I found that to be amazing. It showed that my hard work paid off." It was also a special moment in time for Jonathan's family. "My family was very proud of me," he said. "They were excited about where an award like this would take me, and what doors it could possibly open for my future." 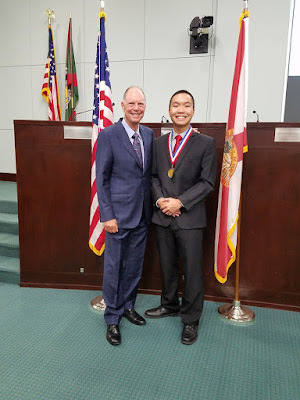 "The award ceremony was held in the Brevard County Commission Chambers. (Assistant Principal) Mr. Waller, my father, and my best friend Amber all came and supported me." Jonathan continued, "As they were calling up the recipients from other high schools, I found myself feeling humbled because their accomplishments were so much more extensive and it just showed the incredible level of talent, intelligence, and determination of others in the room. I felt fortunate to be in their company." "When they called me up, I shook hands with Congressman Posey as they listed off my accomplishments that led to the award. He congratulated me and wished me luck with my future." Florida Congressman Bill Posey, 8th District, recognized the exemplary citizenship and academic excellence Space Coast Jr./Sr. High School senior Jonathan Guarine demonstrated throughout his high school career. "It was very special having the honor of meeting a Congressman," said Jonathan. Jonathan's achievement did not happen by accident; it was a result of many years of concerted effort. Upon entering 7th grade, he enrolled in the Viper Accelerated Program (VAP), which was designed for gifted and high-achieving students who are eager to take their education to the highest possible level through engaging in fast-paced, rigorous coursework. "The first year was so different than elementary school. As a student, you had a lot more choices and more options, inside and outside the classroom. I like how much opportunity Space Coast has for extracurricular activities. I was able to get involved in Student Government and Model Student Senate, as well as tennis." "At first, it was different being with the same people all day long, but we quickly bonded as a group. We helped each other out on assignments. We hung out outside of school on the weekends. We went to a lot of fun field trips together. We've gone to EPCOT, Medieval Times, FIT's Laser Day, Julius Caesar at the Shakespeare Theatre in Orlando, and Universal Studios. The field trips gave us a chance to grow as a group, as well as learn more about the subject matter we were learning in school." Some of the most impressionable VAP teachers Jonathan had during his time in the program were Mrs. Martine, Mrs. Petronella, and Mrs. Hanson. As he reflects back on the positive impact each of these teachers had on his life, great memories abound. "I've grown close with Mrs. Petronella and her classes," said Jonathan. "In 11th grade, I started interning for Mrs. Petronella. I helped create assignments, gathered materials, and did whatever was necessary to support classroom learning. I like it that I can see learning from a different perspective, from a place that I was just a few years ago. Mrs. Petronella is the most caring teacher I've ever had. She's like my second Mom." "Mrs. Hanson and I both have an obsession with Alexander Hamilton. We love Alexander Hamilton. I love him because of the Broadway play Hamilton, which is one of the hottest shows right now. Mrs. Hanson just loves Hamilton because she loves Hamilton. So, Hamilton, government, and U.S. history, that's pretty much all we talk about. Mrs. Hanson is the most energetic teacher with all that she does." "Mrs. Martine was the first teacher to make me cry because she gave me an F on an assignment in 7th grade," Jonathan said. "I remember it vividly. It was petrifying. My heart dropped. I thought, 'This lady is wicked!' But after a few weeks, I came to love Mrs. Martine, and we laugh about it now. Mrs. Martine is the most supportive teacher I've ever had. She's pushed me to apply for Ivy League schools and to reach for the stars." Jonathan's teachers reciprocate the deep respect he feels for them. "Jonathan is an overall wonderful person," said Mrs. Petronella. "He's not only a smart individual, he's a good person. He's going to be massively successful in life." In addition to having strong, supportive teachers, Jonathan correlates his passion for education as a tribute to the sacrifices his family made to afford him his current opportunities. "It's an individual thing where I really push myself," he said. "I feel like I have something to fulfill. My family came from Vietnam, so they didn't have the chance to get an education. That's one of the biggest reasons why I'm so motivated, because my grandparents weren't able to get an education. My parents did, and they took it very seriously. So do I." Jonathan ranks education as one of the nation's top priorities. "The future of the nation depends on education. The people learning in schools will one day administer many parts of society." Advice for young students? "Don't get in the habit of thinking short-term," said Jonathan. "Start thinking about where you want to go in the future, and how you can start preparing for that now." Sporting a perfect 4.0 unweighted GPA and a mind-boggling 4.52 weighted GPA, Jonathan received strong consideration from Ivy League schools, including being selected for Harvard's waiting list, but since May 1st was the national deadline for submitting enrollment fees, he decided to commit to FSU. "I am going to be studying political science while gaining internship experience at the State Capitol," said Jonathan. "Going to college is an opportunity to get immersed into the real world and to make decisions that have bearing over the future. I like meeting more people from around the world, and to gain more perspective. I'm excited and anxious about getting that chance." How does Jonathan feel about leaving the school he has called home for the last six years? "I'm going to miss Space Coast, especially all of the teachers and faculty I've grown close to and who have helped me every step of the way." "After college, I'd like to get involved in public service. Maybe run for office. I like helping others in the ways that they can't really help themselves. Taking the things in society that are in need of help and changing it so the next generation can benefit. That's what I think about." Anyone who knows him would agree: Jonathan Guarine exemplifies the congressional heights of success that can be reached when excellence is the standard. Stay current with Space Coast Jr./Sr. High at Space Coast Edline. "The time is always right to do what is right" still rings as true today as it did when MLK, Jr., first spoke these words during a commencement speech several years before his death. In business and in life, knowing what is right does not always translate into the right actions being taken, yet engaging students in discussions and analysis of ethics in practice can help them internalize the importance of consistently making that critical translation. With such a vigorous belief in doing the right thing, MLK, Jr., would have undoubtedly enjoyed being a part of FIT's 20th Annual High School Business Ethics and Leadership Competition, an event sponsored by Community Credit Union and FIT. Participating students from the Space Coast High School Ethics Team gained a deeper understanding of how the seemingly simple concept of 'doing the right thing' can easily be compromised in an often complex, profit-driven real world. In addition to advising the Ethics Team and facilitating government and U.S. History for Space Coast, Mrs. Christine Le Roy teaches all sections of the career wheel (technology, business, family and consumer science, and careers), personal and family finance, child development, and world history. What is Mrs. Le Roy's take on ethics? "Ethics is taking the high road," she said. "Not waddling in the mud with the pigs. Doing what the little voice in your head says you should do, not doing what everyone else says you should do. Doing what is right. That's ethics." At the ethics competition, students were given a real international case study from Harvard Law School on business ethics, and tasked with analyzing the case to identify an ethical problem and then come up with the best solution to solve the ethical dilemma. "We were challenged to maintain a business mindset, and to consider the country's ethics in comparison to America's ethics, because there are distinct and important differences," said Brandon Devoll, a senior. The case involved an ethical situation faced by Novo Nordisk, a multi-billion dollar pharmaceutical company based in Denmark. "We had to look closely at the off-shore clinical trials the company was performing," said Sara Flanigan, a junior. "We had to ask ourselves whether the trials were being conducted in an ethical manner." C.S. Lewis viewed integrity as doing the right thing when no one else was looking. Certainly, disappointing choices can sometimes be made when the world has their back turned. "In 2008, Novo Nordisk only audited about 10% of their off-shore clinical trials. The FDA and the EMEA (which is the equivalent of our FDA for European countries) only performed random audits on about 1% of those trials, so there is room for error and controversy," said Brandon. However, in the world of ethics, accusations of any wrongdoing should not be unfairly assumed. "To use a common phrase, we had to approach Novo Nordisk as if they were innocent until proven guilty," said Sara. "We had to give them the benefit of the doubt." "Our job was to defend the company," said Laura Sharpe, a sophomore. "If we found they were not operating in an ethical way, we had to make sure we were proposing solutions which would solve the problems." "Our solution was to increase the criteria we use when we hire professional medical staff that oversee the off-shore clinical trials," said Brandon. "Holding the medical staff of the off-shore clinical trials to the same standard that a medical staff would have to be held to if they practiced in Denmark." 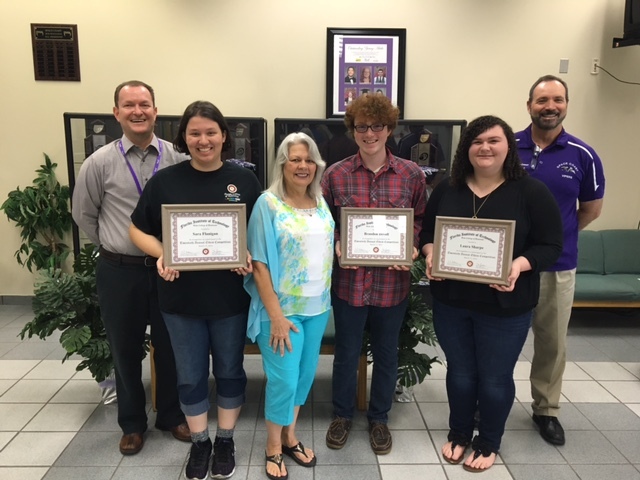 Thanks to their critical thinking, outstanding contributions, and unrelenting commitment to doing the right thing, Brandon, Sara, and Laura were each awarded $48,000 in FIT scholarship money. They also earned cash awards of $125 each for their 3rd place finish in the competition. Joined by Assistant Principal Michael Waller and Principal Robert Spinner, the Space Coast High School Ethics Team includes (from left) Sara Flanigan, Christine Le Roy (adviser), Brandon Devoll, and Laura Sharpe. At a recent Business Ethics and Leadership Competition held at FIT, these students earned a combined $144,000 in scholarship awards. Participants also received plenty of feedback from a judging panel which included high profile professionals with vast experience in the international business realm. "The judges praised how well we worked together as a team," said Sara. "We quoted the Helsinki Declaration, which is the international code of ethics that Novo Nordisk claims to use," said Laura. "We used it as our support, and the judges really liked that approach." "The judges liked how we stood our ground," said Brandon. "They gave us a lot of scenarios to try to get us to delineate from our solution, and we stuck to it and provided support for our solution." The competition was an experience these students will not soon forget. "All of the teams were so nice and even though we were competing against each other, we were all very supportive of one another," said Sara. "It felt great to set a new standard for our school," said Brandon. "I felt very accomplished," said Laura. "You don't want to just do it for the money. You want to do it something that you're passionate about." "You learn so much and make a lot of connections," said Sara. "In my other classes, I was beginning to see things like from a different perspective, like how tobacco companies hold back information about their product, and how unethical that is." "Being on the Ethics Team helps you analyze issues in the real world," said Laura. "It also deals with thinking about solutions once a problem has been identified." "It gave me a more realistic viewpoint of things and helped me understand better why the world is the way it is," said Brandon. "If you are a business owner and you want to keep your business alive, you also have to keep in mind what is in the best interests of your customers from an ethical standpoint. If you want to build and keep a good reputation, you have to do what is right for the people." "That is what our whole case was about," said Laura. "Doing what is right for the people. Doing what is right for the company. Doing what is right for the world." "The business ethics portion of this is about doing what's right for all stakeholders, whether they are directly or indirectly involved with the company's decision-making," said Sara. "I'm so proud," said Mrs. Le Roy. "This is the third team we've taken, and they just—"
"Blew it out of the water!" Sara chipped in. "Yes, blew it out of the water," added Mrs. Le Roy after sharing a laugh with her students. "I also learned a lot about how to coach students at this level of academic achievement," she continued. "By asking a lot of higher level questions and employing a lot of Socratic Method, it enabled me to be a better coach for my students." The Ethics Team is open to all high school students. "In September, we're going to start a new team and get ready for anyone who is interested in joining the Ethics Team and competing next year," said Mrs. Le Roy. What do prospective students have to gain by joining? "A different viewpoint of the world," said Brandon. "You hone in on your critical thinking skills and your research techniques." "Knowledge and insight in a lot of important things going on in the world," said Laura. "You learn that hard work pays off, even if you feel like you're getting nowhere," said Sara. "You also develop skills as a team player." Brandon agrees. "Teamwork is a fundamental aspect, and a key to competing successfully." "You walk away with self-actualization of accomplishment," said Mrs. Le Roy. "You're reflecting back at what you accomplished and saying to yourself, 'Yeah, I did that, and I'm proud of it, and I'm better for it." The Ethics Team's takeaways from the competition prove whether anyone is watching, Mrs. Le Roy has fully prepared her students to do what is right—every time. To read more about the nature of the event, visit FIT's Newsroom. Space Coast Jr./Sr. High School custodian Joe Armet approaches cleaning the same as he approaches living: with purpose, enthusiasm, and a signature smile. "I like working with the teachers and making sure they are satisfied," said Joe, who is charged with keeping 14 rooms in the 600 building clean and comfortable for teachers and students. "My goal is to try to keep the rooms clean. The desks, the floors, the blackboards. I also pay attention to shelves and anything else that needs cleaning." A Brevard resident for over 45 years, Joe moved from New York to Florida when he was 18 years old. "That was 1971," he said. "Port St. John was nothing but clear land. The streets were paved but that was pretty much it. The rest of it was just trees and land. No houses. No buildings. Nobody lived around here." Now the area is thriving with families, businesses, schools, and churches among a hardworking, tight-knit community. Joe's contribution to the area is something that comes natural to him. "Pretty much all of my life, I've been cleaning," he said. "I worked for a cleaning business for 18 years. I also worked for Publix for nearly 25 years and did a lot of cleaning in that job." Other work experiences include driving limousines and charter buses, as well as working at Disney's Animal Kingdom. "I drove a lot of kids on prom nights in the limo, and took kids to field trips in the charter buses," he said. "I also loved working for Disney, but the drive from Brevard was just too much to keep up with it." Space Coast Jr./Sr. High School custodian Joe Armet is known around campus for his positive attitude and ever-present smile. "I like the people I work with, and try hard to help others," Joe said. Joe holds close the memories he has of being a high school student. "In Long Island, I attended a vocational school called Lawrence High. It was the same high school where Peggy Lipton went. She was a famous actress of a popular show at the time called The Mod Squad. The school was close to Jones Beach, where we loved to go to hang out." Part of why he now enjoys working in a school is his passionate understanding of the connection between a quality education and a satisfying life. "In high school, I wanted to be a football player. I thought I'd be good at it because I was a big guy, a real big guy." Shaking his head, Joe added, "But it didn't work out." As many adults like Joe can relate, not all of the big dreams, hopes, and goals one has in youth come to fruition. "That's exactly why kids need to stay in school," he said. "No matter what, getting an education is going to help." Encouraging students to stay in school is at the heart of Joe's advice. "These days more than ever, kids really need to stay in school and get that diploma. I don't want to see anybody dropping out. There's not too many full-time, good-paying jobs out there without getting an education." "Education is so important," he continued. "I know it was for my daughters. Both of them got a Master's degree from UCF. One of them does cancer research. My other daughter is an event planner for major companies. They make good money and live comfortably, and a lot of that has to do with the quality education they got. They have both done very well." These days, one of Joe's favorite pastimes is baking. "I love making cupcakes. I do Easter cupcakes and Christmas cupcakes. I also make them for people's birthdays. Strawberry is my famous cupcake—I put real strawberries in them!" When he's not baking, Joe enjoys gardening, yardwork, and swimming. But life hasn't always been smooth sailing. In the prime of his career with Publix, Joe was diagnosed with cancer, a struggle which knocked him out of work. "I was near death twice but I survived it. It was difficult for me and my family, but it taught me a lot. Now I strive to make the most out of each day, and I always try to make everybody smile." "Publix helped me out a lot during that time. Both my manager and my assistant manager at the time gave me money out of their own pocket to help me survive and support my family. It meant the world to me that they cared so much." Eventually, Joe beat cancer but the battle came at a great cost, including the loss of his family's home. "At that point, my wife helped me looking for a job. I wound up getting a job as a security guard at Clearlake Middle School (which since closed and then reopened as an Adult Education Center) for 10 years. My job was to make sure the school was safe, all the doors were locked, and no break-ins occurred." "Around that time we moved to Palm Bay," said Joe. "Now, working here, it's a long drive to Space Coast from Palm Bay but it's absolutely worth it. I wouldn't want to be anywhere else. When you're happy where you are, you stay where you are." Joe had a flair for life long before he battled cancer, but he has savored every day even more ever since. "I believe people should be happy and be kind to one another. That's what I try to do day by day." With the purposeful, enthusiastic way he approaches his work, it is no wonder why Joe brings such big smiles to the faces of so many people. Sometimes working backwards from the finish line provides unique opportunities for identifying how to improve performance from the start. A talented group of students from the Florida Institute of Technology (FIT) chapter of the American Society of Mechanical Engineers (ASME) recently presented a highly engaging, interactive lesson to Space Coast Jr./Sr. High School Science Technology Engineering Aerospace and Manufacturing (STEAM) students on a process referred to as reverse engineering. Equipped with tools and typical home appliances such as Crock-Pots, coffeemakers, and hair dryers, the FIT students guided Viper students through the process of disassembling the machines to analyze their original design, discussing why particular parts were strategically used instead of others, and making suggestions for design improvements. During a culminating presentation, students then shared with their peers what changes they would make to improve the functionality of their assigned appliance, and how such changes would yield positive outcomes to the appliance's productivity and/or efficiency. "Reverse engineering is basically taking something apart, figuring out how it works, and figuring out how you can improve it," said Isaiah Ciarlanti, a senior. "You have the appliance itself and how it already works," said Wyatt Christian, a senior. "They wanted us to find a way to make it work even better, to improve its function." Reverse engineering, also referred to as backwards design, was the focus of FIT's recent visit to Space Coast Jr./Sr. High School's STEAM Academy. By disassembling various household appliances, students were able to explore how each machine was designed, as well as investigate potential changes to improve its performance. "My group took apart a Walmart version of a George Foreman grill," said Wyatt. "When we opened it up, we saw the heating element, which was only a small strip. To improve that, we figured we would expand the strip to cover more surface area of the hot plate, which lead to better heat distribution and faster cooking." For Wyatt, hands-on experiences like these parallel the work he will do upon graduation. Enlisted into the Air Force, Wyatt will be a crew chief working on fighter jets. "My favorite part of the activity was having everyone working together for a common goal," he said. "My group had an electric razor," said Isaiah. "When we took it apart, the switch where the wires went in came out easily. If the switch was in the Off position, we could just pull the wires out. We figured the only way to make it better was to fix the battery housing so that the wires would be safer and more secure." "When we were taking the appliances apart and figuring it out how it worked, the people from FIT came around and asked us questions and were really engaged with the process. They weren't just sitting in the front of the room telling us what to do. That makes it more exciting as a student. Even if it is hands-on, if no one is moving around and participating, it is not as fun. When everyone is learning together, it makes the experience a lot more fun." "They would walk around and each person would give different inputs," said Isaiah. "Each person had a different way of looking things, which helped us." "The FIT students were cool and helpful," said Wyatt. "They gave us a lot of good ideas." One of the FIT students, Leyane Mohammed, is no stranger to Space Coast. A Viper graduate, she successfully completed the STEAM program and is currently in her senior year at FIT. "I talked to Leyane," said Isaiah. "She walked around, asked us about what we were doing, and offered assistance. She helped us make sure we listed everything accurately." The field trip idea was spearheaded by Dr. Beshoy Morkos, an Assistant Professor for FIT's Department of Mechanical and Aerospace Engineering. He oversees the Systems Research on Intelligent Design and Engineering (STRIDE) Research Lab. "Dr. Morkos was very energetic," said Isaiah. "He definitely brought life to each of the projects. For the electric razor we took apart, he got so into what we were doing. It was really cool to see someone who has been doing it so long get so interested in the project. That kind of enthusiasm helps get students more excited about learning." 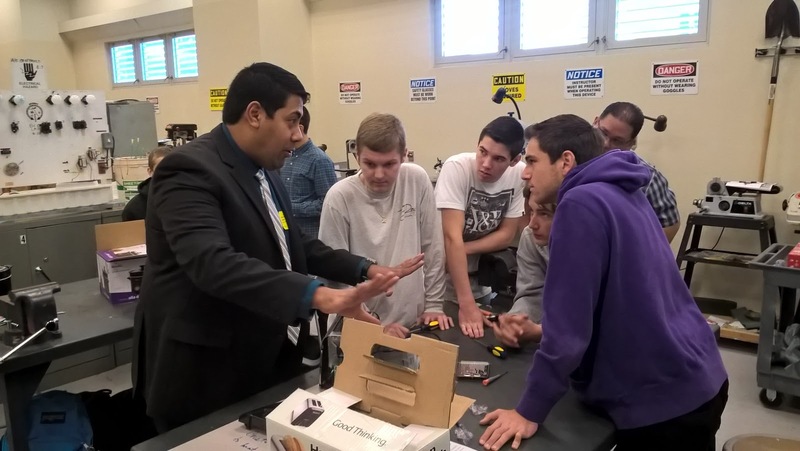 During his visit to Space Coast, Dr. Beshoy Morkos worked closely with students in teaching how the reverse engineering process can lead to improvements to the design of various household appliances. 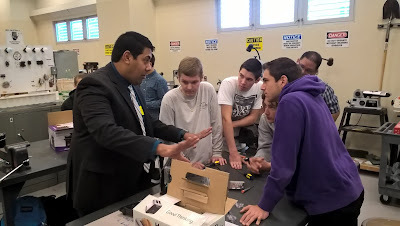 Overall, the benefits of the reverse engineering process were apparent to participating students. "It is interesting to know how things work," said Isaiah. "It helps with creativity. Obviously, the person who made it has succeeded with coming up with an idea. It helps you think outside of the box about what can be done to make it even better." As FIT's visit to Space Coast proved, when it comes to building knowledge and expanding critical thinking skills, nothing beats working backwards from the finish line to help improve performance from the start. A fresh coat of paint can score many positive outcomes: brightening the look of a bedroom, changing the feel of a living room, and reviving the appeal of a house. But sometimes the value of a new paint job runs much deeper than one can see on the surface. 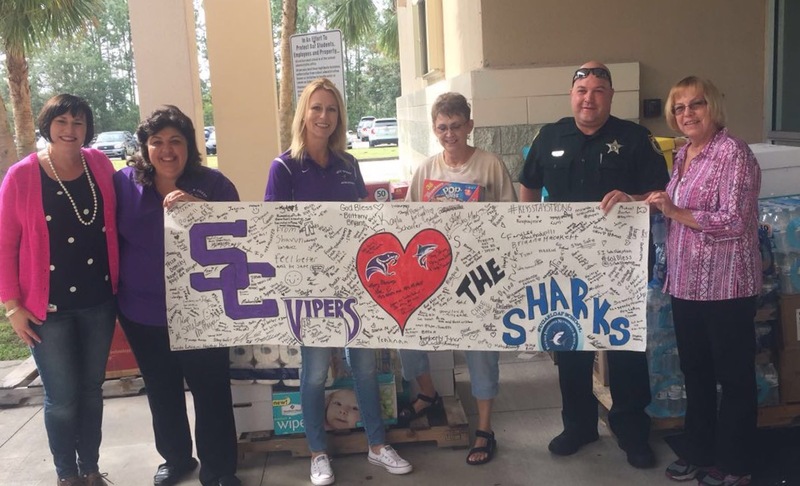 What began with a family's pleas for assistance at a Titusville City Council meeting ended with a community service project a caring group of Viper student athletes will not soon forget. In addition to being a Space Coast social students teacher, Mr. Matt Barringer is a business owner and a Titusville City Councilman. 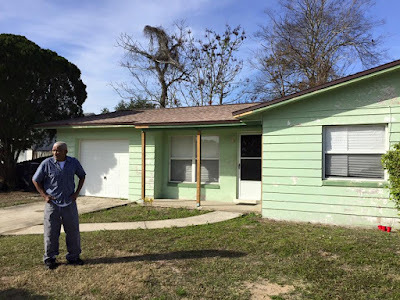 During a recent city council meeting, his heart went out to a homeowner of 45 years, Mr. Walker, who asked the council for assistance with painting his house. On an already stretched budget, the city council was unable to spare the funds to fulfill the request. Mr. Walker has lived in his Brevard home for nearly five decades. He recently reached out to the Titusville City Council to request assistance in getting his house painted. Although his request was denied at a formal council meeting, City Councilman Matt Barringer would not allow Mr. Walker's pleas for assistance to go unheard. However, Mr. Barringer was determined to find a way to fulfill the family's request for help. "It was a team effort. We linked up with Aging Matters, which helps seniors in Brevard county. They came out and pressure washed the house to prep for the project. My office paid for the paint. Then Coach (Michael) Pommier's team came to do the painting." Austin Rodeghier, a senior, is the Captain of the varsity boys basketball team. "Coach Pommier told us doing this would help change someone's life. He was right." "I kept stressing how important it is to think outside of your own life, and to think about how you can help others," said Coach Pommier. "I tell them our basketball program is about being a part of something bigger than yourself. The team seemed to buy into that concept." The players arrived early in the morning prepared to do what it takes to see the project through. The project required six hours of difficult labor on a Saturday but the players fit in plenty of laughs along the way—the house wasn't the only thing that got painted. "It was a really funny day," said Austin. "We ended up painting each other and having a good ol' time." 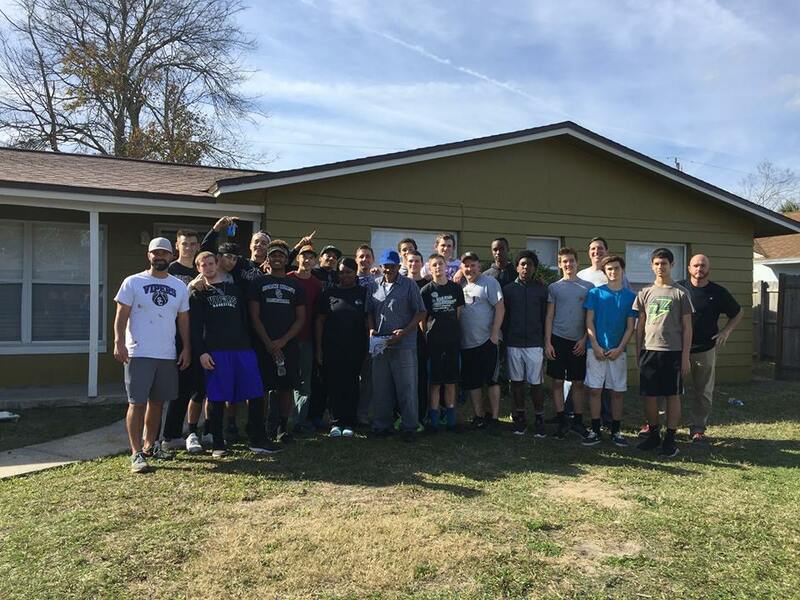 Painting a house is a formidable task, but when the Space Coast boys basketball team had an opportunity to help a family in need, they did not hesitate to pull together and put forth the team effort required to complete the job. When the painting was done, Austin presented the homeowner, Mr. Walker, with a picture of the team and a Vipers Basketball T-shirt. "Even if Mr. Walker hadn't said anything, you could just tell by his expression how much he appreciated having us come here and help out." "Mr. Walker said he used to love to play basketball when he was as kid," said Austin. "He played point guard, which is the same position I play, so it was pretty cool we had something in common. He also said he could relate to what we were doing because when he played on a team, they used to do things outside of basketball to bond as a team." "Mr. Walker's family came up at the end and they were all up in tears and really grateful for everything," said Coach Pommier. Austin said, "I thanked Mr. Walker for letting us come here and help paint his house and he said, 'Thank you much!' and asked if he could get a photo of all of us together in front of the house. So we took the picture." With their paint brushes and positive attitudes, members of the Space Coast Jr./Sr. High School varsity/JV boys basketball teams lifted up a family in need. The homeowner, Mr. Walker (blue hat in center of photo), expressed heartfelt gratitude for the team's selfless act. "Our team has a group text," said Austin. "We were all talking about how cool it was to do something off the basketball court to help someone in need." "It's always nice to help people," said Briggs Kline, a sophomore. "In my church, there is a big focus on giving back to others. It's great to give back and not to get anything back in return. It gives you a great feeling in your heart." "It felt awesome," said Darryl Davis, a junior. "We worked together as a unit to complete a project and to help out a family." The two Space Coast employees responsible for bringing the painting project to fruition deflected credit to each other. "Mr. Barringer is the one who spearheaded it," said Coach Pommier. "Coach Pommier was the driving force on this one," said Mr. Barringer. "He was committed to doing a community service project with the students." Clearly, what mattered was not who got the credit but that the family in need got the help it deserved. "The best part was helping a family in need," said Coach Pommier. "It was one of those where you take something that didn't work out and it worked out beautifully," said Mr. Barringer. With acts of kindness, the givers often walk away with as much benefit as the receivers. "I think this experience has changed us," said Austin. "It helped us put aside our differences. It changes how we look at things outside of basketball, and makes us think about what we can do off the court to help other people." "It puts things into perspective," said Coach Pommier. "You get to see kids coming out of their shell and being a different kind of leader than they are on the court." Slam dunking a lesson on the value of helping others, long before the paint dried, members of the Vipers boys basketball team had already gained a fresh new perspective on life. Walk around the 700 building of Space Coast Jr./Sr. High School and you may notice a man with a strong work ethic and quiet, unassuming demeanor wearing a backwards Hurley hat. "In general, I'm always running around making sure everybody is taken care of," said Mr. Grant Witters, who is serving in his first full year as a custodian at Space Coast. While keeping his assigned areas clean is important, he understands the value of maintaining quality relationships with people. "I try to keep a good relationship with the teachers. I'm really spoiled in the 700s. It's nice how some of the teachers will call me over and say, 'Hey, Grant, I got some food for you!' The teachers take good care of me, just like I try to take good care of them." What is it like working at Space Coast? "Everybody has been super friendly," said Mr. Witters. "It's a calm place to work. It's not like I'm burning the candle at both ends. I really enjoy the atmosphere and I like working here." How does Mr. Witters approach his work? "At the end of the day, as long as I'm satisfied with what I've done and anyone can come behind me and say, 'He's done a great job!' then I feel like I've done everything I can do." Grant Witters works hard to take care of the Space Coast campus so students, teachers, and staff can thrive. "I'm just like everyone else. I want to make sure I do my job thoroughly and do it to the best of my ability." While this is his first position working at a school, Mr. Witters is very familiar with the Brevard school system. "I've lived in Brevard County my whole life. My mother has taught at schools around Brevard county for nearly 30 years." He smiled. "From her, I've heard everything. All the stories." Having previously worked for a paint company for over 15 years, Mr. Witters appreciates the transition from those stressful, hectic weeks of working 12 hour days to a calmer environment and less demanding work schedule in which he has more time to spend with his family during the week. "I was looking for something where I could spend a little more time with my boys." His boys are 9 and 12 years old, respectively. "My last job, by the time I got home, I was mentally and physically exhausted. It was very mind-taxing. This job allows me to leave here after a long day's work, and still have the mental and physical capacity to enjoy time with my boys." Hobbies and interests? "Music is definitely a passion of mine. I've loved music ever since I was a kid. Now my older son is opening me up to different kinds of music. Everywhere I go, it's music. If it's not the headphones, it's the stereo in my car." As a hobby, Mr. Wiiters plays drums. "I played in the drumline at Titusville High School. Since then, I've played in several bands just for the fun of it, but nothing serious. I've played anything from heavy metal with my friends to Gospel swing at my church." "I got my kids into music, too. My 12 year-old son is learning how to play the guitar. My 9 year-old already plays the drums as well as I did when I was 13." He laughed. "I've got two mini rock monsters." Playing music also makes for a fun family activity. "My youngest son has a smaller drum set. I'll sit behind him and play a little bit, and my other son will play his guitar, and the three of us will jam together." An avid outdoorsman, Mr. Witters used to ride dirt bikes when he was younger. "These days, I just like watching my kids skate at the skate park. They'll go up and down the ramps. I'll inline skate but I don't get as crazy as I used to with the skating. I'm happy watching my kids have fun doing their thing." 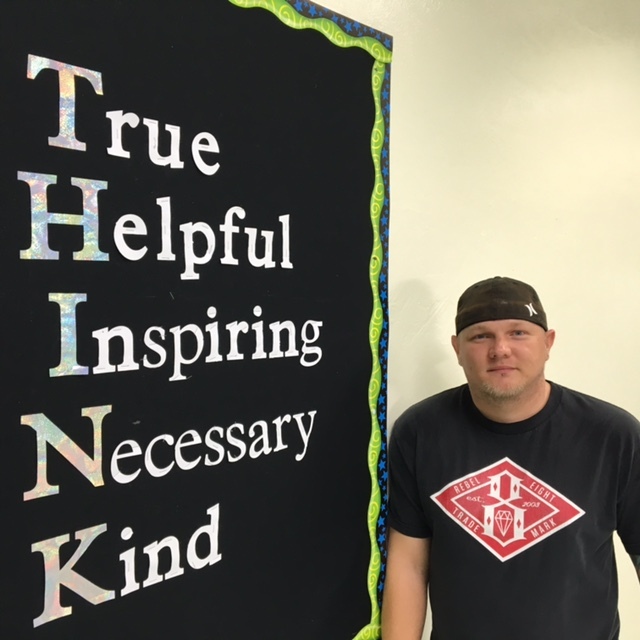 It is important for students to understand hardworking custodians like Mr. Witters are not here to pick up after them, but rather to keep the school clean for them. There's a big difference. "The hardest part of the day is lunch duty," he said. "Most kids are great but some students don't do well at picking up after themselves, which makes me wonder if they pick up after themselves at home. Either place, it's the right thing to do to pick up after yourself." "But I still enjoy working in the cafeteria. It gives me a chance to get more involved with the students. Otherwise, I'm usually behind the scenes, and they don't even know I've been around cleaning classrooms." What is a fun fact no one around Space Coast may know about Mr. Witters? "I do security for the home games of the Molly Rogers Rollergirls, a roller derby team based out of Melbourne. It's a lot of fun." An interesting fact to go along with an interesting person. 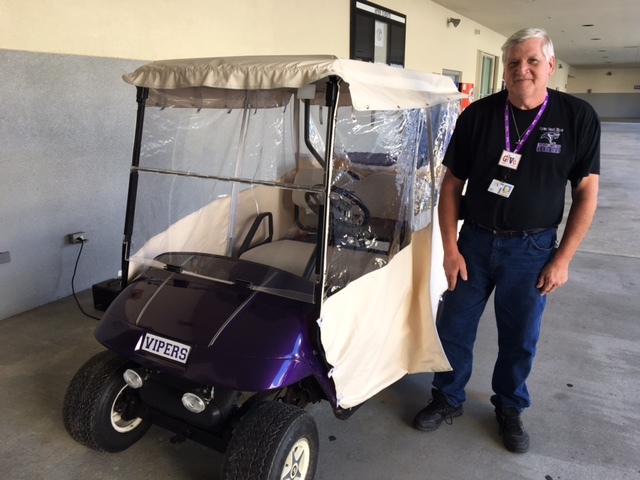 Space Coast's head custodian, Mr. Rick Fink, knows what Mr. Witters brings to the table. "I would like to encourage everyone to welcome Mr. Witters to our Viper team. He brings a vast amount of knowledge and skills to the position. It is a pleasure to have him on our team." Mr. Fink certainly agrees the modest man with the backwards Hurley hat is committed to doing exceptional work for the students, teachers, and staff he serves. This story is part of a series of features about the dedicated team that helps keep Space Coast a clean, comfortable environment for students to learn. Stay tuned for related stories throughout the school year.